I am the head chef at a little family restaurant called Chez Mason. Most nights I plate for eight, six of my guests being under the age of 15. The menu is seasonal with a Mediterranean flair. Broccoli, salmon and blueberries are on regular rotation. House rules: No TV or cell phones at the table. Bless the meal and the people sitting around the table. Guests do the dishes. A family friend gave me the best advice when my older kids were toddlers: Make family dinners special occasions. I took her wisdom to heart. Come to my house on any school night and you might think I was having a fancy dinner party. Our wood-beamed farm table is set with votive candles, bud vases of fresh herbs or cut flowers from the garden, and even the two year-old gets a pretty linen napkin. I want my children to see that time spent around the dinner table with good food and the people you love is life at its very best! The secret to full and beautiful living is simple: Make ordinary moments sacred. A family favorite at Chez Mason is my recipe for spaghetti and meatballs. My friend Marti, the owner of MEEL, gifted me with a stellar recipe for a quick and yummy meatball and I put my spin on it. I make them extra healthy by sneaking in the spinach and parsley! You can find my quick recipe for a simple homemade tomato sauce on the blog or try Rao’s or Mario Battali’s sauce in a bottle! Whisk the eggs in a large bowl until blended. Add your salt, oregano, a generous quantity of black pepper, Parmesan cheese and greens. Combine meat, egg mixture, yogurt and bread crumbs. Use your hands to thoroughly mix the ground meat. Pinch off a piece of the meat mixture and gently roll between your hands to form 1½-inch meatballs. Continue shaping until all the meat is used. Arrange the meatballs spaced slightly apart on a baking sheet. Bake at 400°F for 25 to 30 minutes. The meatballs are done when cooked through and the outsides are browned, and when they register 165°F in the middle on an instant read thermometer. In a separate sauté pan, warm either homemade (See my quick Mamma Mia sauce https://www.breadandhoneyblog.net/mama-mia/or pick your favorite jar tomato sauce. Transfer meatballs into the sauce. Serve over a mound of spaghetti and generous dusting of grated Parmesan cheese. Accompany with a simple arugula salad, shavings of Parmesan and dressed with olive oil, juice from one lemon and Kosher salt. For my kids, I roast broccolini, dress with lemon juice and grated Parmesan cheese. 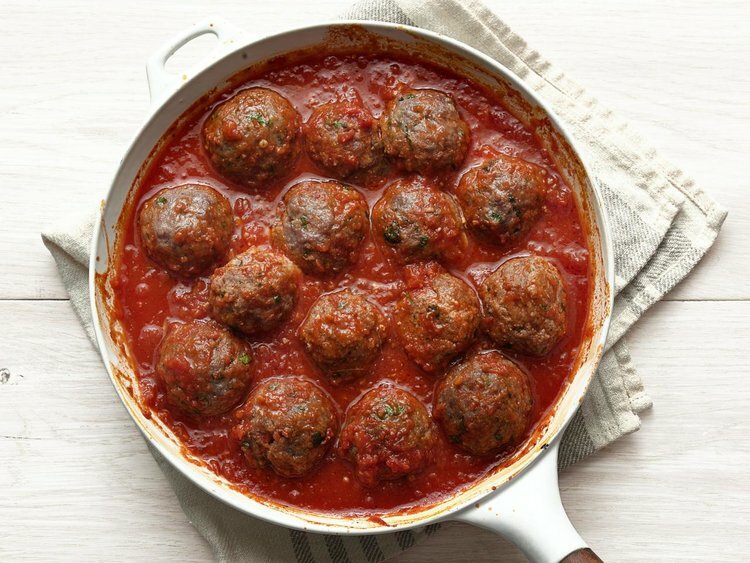 In a pinch, treat yourself and order the Meat Ball bundle from MEEL. Marti will deliver meatballs, sauce from Cafe Nonna and hand-made pasta from Nicoletta’s! Deliveries on Monday and Thursday every week. Thank you, Farrell, I love this idea and this recipe!!! Will try these this week ! Well, thanks! That ‘Bread & Honey’ just triggered a/the Pavlovian response of a cascade of gastric juices – and its only 1:30 in the afternoon! Snacking is good – I hope. I treat my meals w/the same sacred regard!!! Got this in my oven right now….setting up for tonight’s dinner! Smells divine!!!! GRATITUDE!